Riding in a vehicle with the seatback reclined could lead to serious or fatal injury in an accident. 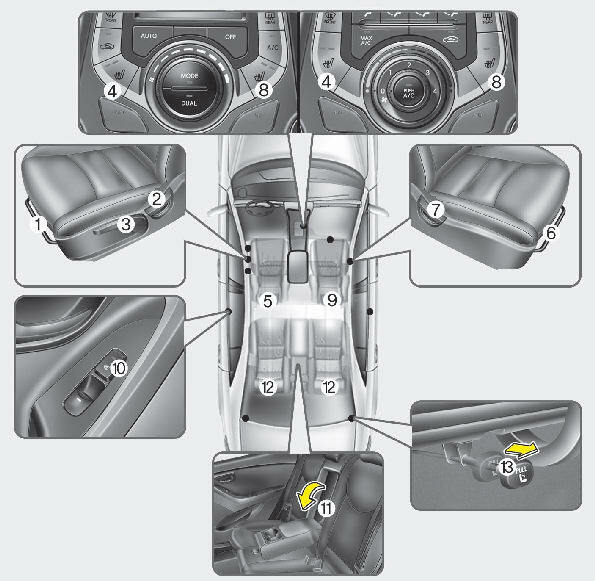 If a seat is reclined during an accident, the occupant’s hips may slide under the lap portion of the seat belt, applying great force to the unprotected abdomen. Serious or fatal internal injuries could result. The driver must advise the passenger to keep the seatback in an upright position whenever the vehicle is in motion. Never attempt to adjust the seat while the vehicle is moving. This could result in loss of control, and an accident causing death, serious injury, or property damage. In order to avoid unnecessary and perhaps severe air bag injuries, always sit as far back as possible from the steering wheel while maintaining comfortable control of the vehicle.We recommend that your chest be at least 10 inches (250 mm) away from the steering wheel. The rear seatback must be securely latched. If not, passengers and objects could be thrown forward resulting in serious injury or death in the event of a sudden stop or collision. No passenger should ride in the cargo area or sit or lie on folded seatbacks while the vehicle is moving. All passengers must be properly seated in seats and restrained properly while riding. When resetting the seatback to the upright position, make sure it is securely latched by pushing it forward and rearwards. To avoid the possibility of burns, do not remove the carpet in the cargo area. Emission control devices beneath this floor generate high temperatures. Luggage and other cargo should be laid flat in the cargo area or on the folded rear seatback. If objects are large, heavy, or must be piled, they must be secured. Under no circumstances should cargo be piled higher than the seatbacks. Failure to follow these warnings could result in serious injury or death in the event of a sudden stop, collision or rollover.